MediaFire is a popular file sharing and hosting service that will surely win you over with its intuitive interface and powerful sharing options. With only few clicks of your mouse you will be able to upload, download, managed and share your files, videos, images, presentations and more. Online Cloud Storage for Everyone! Sharing is a central feature of MediaFire, so try it out and see how much your life will become easier and your collaborative work more manageable. Maintain in touch with your family, report to your clients with up to date project files. With MediaFire, everything is possible. Among many file sharing solutions you can find on the internet today, MediaFire managed to distinguish itself by giving everyone access t very simple tools for uploading and sharing files with your friends, family and co-workers. With over 60 million users and daily traffic of hundreds of millions of files, MediaFire represents one of the biggest players in the field of internet file sharing. The only thing that you need to consider before using it is how much you want to simplify your life, accelerate your business and make difficult file sharing a thing of a past. With MediaFire, all those things are present even if you don’t have account! MediaFireis a web application powered by significant amount of cloud computing, enabling dozens of millions of users to daily upload, access, and share files via the internet. You can start upload by simply dragging and dropping file of your choice to your browser window, and when the file is uploaded, recipients can download it quickly on their PC, Mac, smartphone or tablet without any need to fill of captcha or encounter similar frustrating roadblocks like simultaneous download limit, waiting times and download speeds. By focusing on removing limitations to users and ensuring smooth, easily accessible and most importantly secure environment for your data, MediaFire definitely manages to distinguish itself from its large competition. Interface of MediaFire is sleek and intuitive, enabling anyone with account to easily upload and manage files in an editor that has all the most commonly used features. When you log in into your account, you will be welcomed with a simple file editor in which you can sort your files and directories at your wish. Files can be viewed both in list and thumbnail form, which helps greatly when you are managing picture files. The basic design that is based on the mix of silver and multi-colored blue colors is pleasing to the eye, with interface that is free from clutter and sharing options that are easy to understand. Uploading of files is possible either by integrated upload tool or by drag&drop. 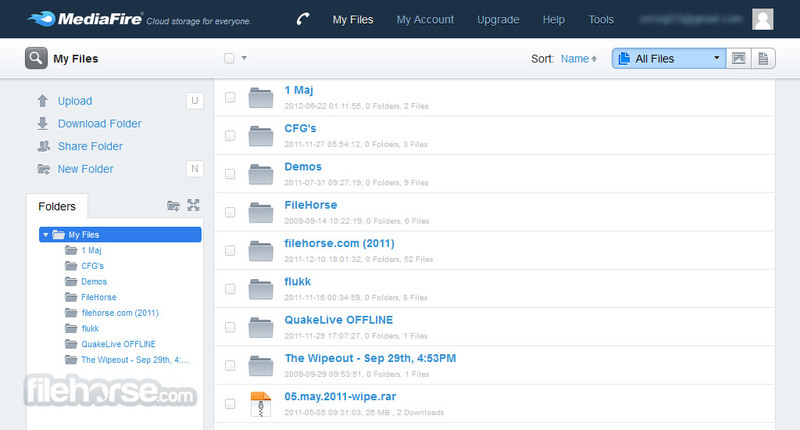 You can also use drag&drop to manage files on your MediaFireaccount. Online Cloud Storage for Everyone! Registration process for MediaFire is streamlined to be very easy. Just click “Sign Up” button on the main page of the site, chose membership level (there is a free option available) and then provide a valid email address, name, optional display name and a unique password. If you have selected a paid subscription, you will also be prompted to insert your credit card information. There are three levels of membership on MediaFire. Free plan gives uses simultaneous download of files at unlimited speed, unlimited online storage and a 200 MB maximum file size, limited long term storage and few other smaller features. For $9 per month minimum file size will be increased to 4 GB, advertisements are removed, files are more securely backed up with another separate copy, more stats, download options and customizations. The most expensive payment tier requires monthly subscription for $49, which gives you custom domains, detailed logs, and ability to add additional user to your account for additional $3 per month which is great for larger businesses. From novices to professionals, small-scale file sharing to coordinating work in large businesses, MediaFire Online Cloud Storage for Everyone! has the tools, infrastructure and the ability to make every user happy. Try it out and see for yourself! From home to work or Anchorage to Tokyo - securely access your files ANYWHERE your travels take you! Your files are always safe and sound on MediaFire. “Not again Milton!! That's the wrong revision!” Hate having your documents out of sync? Get your whole team on the same page with MediaFire’s document collaboration. Especially when you use MediaFire. Quickly and simply share images, documents, video, audio, and ANY other type of file (200MB max file size). Share via email, instant message, Facebook, Twitter, or embed on your webpage – it’s super easy! You’re in luck! 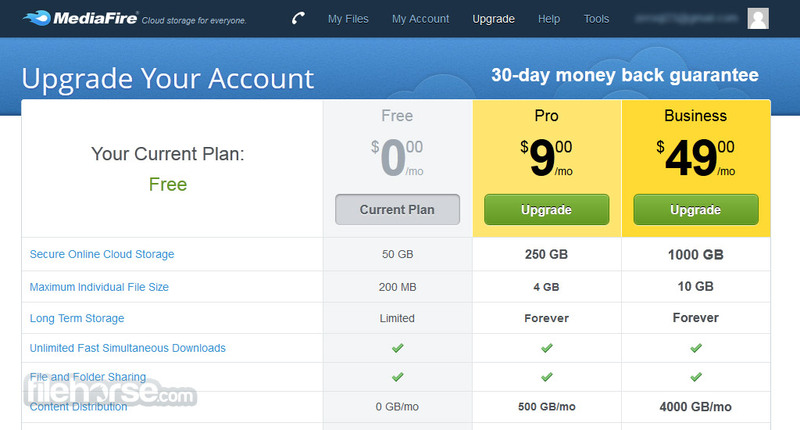 All new MediaFire accounts START with 50GB of free storage! Need more? Professional and Business accounts get up to 1000 GB! Online Cloud Storage for Everyone! Upload and share files right from your desktop or mobile device with MediaFire Express and Mobile! There are tons more MediaFire features for you to discover after creating your account.